High and rising levels of nonperforming loans in the euro area have burdened bank balance sheets and acted as a drag on bank profits. Banks, striving to maintain provisions to cover bad loans, have had fewer earnings to build-up their capital buffers. This combination of weak profits and a decline in the quality of bank assets, resulting in tighter lending standards, has created challenging conditions when it comes to new lending. We took a closer look at this relationship and the policies to help fix the problem in our latest Global Financial Stability Report because credit is the grease that helps the economy function. 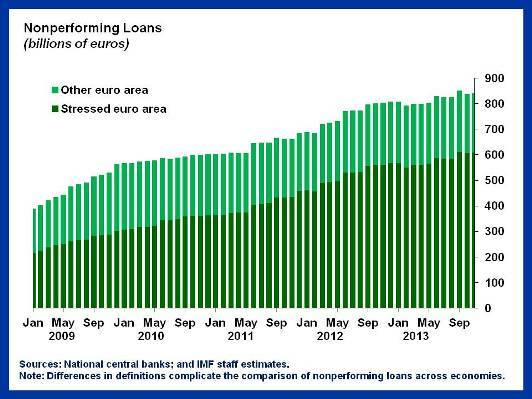 The stock of nonperforming loans has doubled since the start of 2009 and now stands at more than €800 billion for the euro area as whole (see chart). Around 60 percent of these nonperforming loans stem from the corporate loan book. There is a need to resolve this large stock of nonperforming loans clogging bank balance sheets. But there has not been much progress to date. The stock of nonperforming loans continues to rise, albeit at a slower pace than before, and banks have sold less than 6 % of the stock of nonperforming loans. Resolution has been hampered by three key factors. Bank financial capacity—capital and provision buffers—to dispose of nonperforming loan portfolios given the current gap between what the loans were originally worth and what financial markets think they’re worth now. Bank operational capacity to handle the quantity of bad assets. Legal system capacity to process nonperforming assets—though a number of countries have recently introduced reforms to speed-up debt workouts—and relative immaturity of out-of-court restructuring frameworks in some countries. Policymakers and banks have two other avenues they should pursue. First, banks need to clean up their balance sheets. The ongoing assessment of banks, conducted by the European Central Bank and the European Banking Authority is a first step in this process. The assessment needs to be credible, reliable and transparent, and should be followed by remedial actions that are implemented on a timely basis and clearly communicated to the market. Regulators should help to improve the transparency, timeliness, frequency and harmonization of bank and corporate balance sheets to aid the assessments of bank and corporate creditworthiness. Along with measures to facilitate an increase in corporate equity levels, including via targeted measures to encourage debt-for-equity swaps, authorities and markets could develop nonbank sources of credit, including bonds, further. However, officials need to ensure that effective regulation and supervision of nonbank entities should accompany these efforts to avoid building future problems. Official guarantees may be required, though governments should offer them in amounts consistent with the overall fiscal position of the economy, and structure them to prevent leaving guarantors with poor credits. Euro area policymakers face a daunting task in addressing the legacy debt burden to help complete the transition to an integrated financial system. Without significant policy efforts to address the burden of nonperforming loans, some economies may find they remain stuck in the mire of low profitability, low credit and low growth.